The question is, which numbers did she call? We can assume that the police has the phone records, and they know which numbers were called. I THINK that if Debbie had called her husband, the police would've asked him. If Jeremy denied the call, then they would know he was lying and then they would've pushed for the lie detector. So, who did she call? Considering Jeremy's cell is missing ... I believe that Debbie called him. Could it be that these two thought by disappearing the cell phones ... communication could not be traced. At one time that was my thought process. The two boys at the house are aged six and eight, CBB. This much I'm sure of: If the Mom is lying.............. she's a GOOD liar!! Hi everyone. I know you read the reports and you can easily think, "ya right she did it" then you see her and she is besides herself....Don't know what to think. I'm right there with you, Tracy! At this point, I'm beginning to lean toward her being a really good liar. I think the cell phone records will be key in this. snipped; not msm and could be false but still food for thought imo. The heart-breaking ordeal involving a missing 10-month-old Kansas City, Mo., girl is weighing especially heavy on the minds of relatives here in Delaware County. Deborah Netz Bradley, the mother of baby Lisa, is a second cousin to Donna Pretti, an investigator for the Delaware County Medical Examiner’s office, and Eddystone Patrolman Joseph Pretti. Donna and Joe are first cousins. Well, it's possible that a second cell phone was obtained for the purpose of keeping up with them. Detectives have no desire to poly father because his story checks out??? So who was mom talking to that night? More confusion for me! Blaaaaaa! 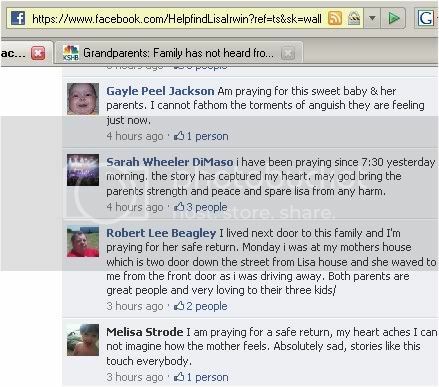 Have to wonder if the mom is upset because her baby was kidnapped or because the baby cannot be found? Perhaps she was thinking the baby would be found that night. Or was she on the phone with a third party she does not want her hubby/LE/public to know about? I am baffled as well. It is obvious that she loves this baby and the child appears to be well cared for. The only thing I can see is an accident of some kind that led to the death of the baby and Deborah panicked called Dad and they together cooked up this story. She is definitely an Emmy award candidate if she is lying. Dad's story may check out for the night that Lisa allegedly went missing but ... what if something bad happened the previous day/evening and ... the stage was set prior to leaving for work? Considering his relationship to Lisa and ... the possible senarios ... somehow I do not believe that LE declined Dad's offer to take a polygraph. I've got a few things I need to attend to........... check back with you guys shortly! I wonder if the mother not doing well on the poly has something to do more with something she is not disclosing about herself and not little Lisa. What I mean by that is, what if perhaps, she was having an affair? Could the middle of the night call (if a call was really made) been to this lover and she is trying to hide this from her husband...thus indicating deception on the poly? And if this is the case, could there be a scenario where she was either preoccupied with this call, breifly left the home (GASP), etc that would have opened up the opportunity for someone to come in to the house after seeing SHE had left AND the hubby wasn't home? OR could the lover themselves have taken the baby for some reason. I know...probably far fetched, but just trying to understand why deception on the poly but what seems to honest emotions from the mom. Good thinking, maybe something happened to her way before he left for work and they planned that kidnapping scheme. However, that would not explain the 2:30am call. There may be more than one call? Though we know how some people inject themselves into a popular news story. This guy had seen Lisa during the day at the door while he was driving away, the door had to be open because not much can be seen with the door closed. Than we have the smirking smiling (idk he appeared stoned to me on interview) neighbor behind them who is convinced they(parents) did something. I hope that guys property was searched good. Irwin parents avoid local media video. New car? someone has cash to burn, cheap but still. Young on Faux news now. He said no he is not reporting that she failed miserably. Have not spoken to family at all today. Does not know about 2:30 phone call and has not heard that from lead detectives. Don't read to much into removal of mobile command post. Not aware of father in regards to LDT. Basically he is eye candy with no real answers imo. ::snipping2::SHAWNEE, Kan. - The FBI confirms a search of a Johnson County landfill is connected to the case of a 10-month-old missing Kansas City girl. More than a dozen law enforcement officers are searching the Deffenbaugh Industries Johnson County landfill in white protective suits. Never a good thing to hear. Page created in 6.151 seconds with 19 queries.